The dimensions are 1077mm x 1200mm x 390mm. This fire uses one of our large burners. It has a fuel capacity of 2 litres and 1 litre will burn for 2 - 3 hours. The heat output for this fire is 2.5KW per hour. 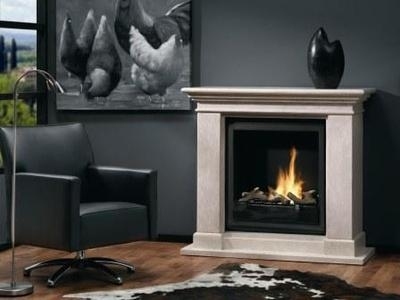 The Bio Flame Kos is one of our largest freestanding fires. You cannot argue against the wonderful styling of this modern fireplace. The Kos was designed to be very bold, yet not fussy. It is is difficult to find a room that this fire would not complement. It is shown here in fossil stone off-white with a plain black insert and brown ceramic logset. The Kos uses a unique burner with a patented ceramic core. The Kos burns bioethanol fuel, which unlike gel fires does not need cleaning.